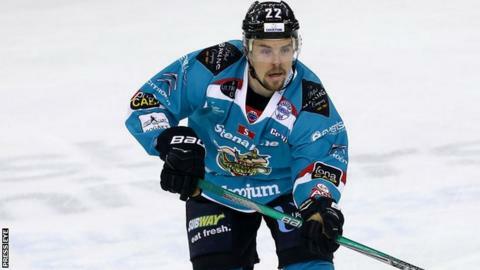 The Belfast Giants' hopes of sustaining an Elite League title bid suffered a blow as they lost 4-3 to Nottingham Panthers in a penalty shootout. Sunday's match at the SSE Arena ended 4-4 after overtime and Andy Bohmbach scored the winning penalty after Mike Forney had missed for the Giants. Colin Shields, James Desmarais, Kris Beech and Mike Radja found the net for the hosts during the match. Robert Farmer, Juraj Kolnik (2)and Stephen Schultz scored for Nottingham. The Giants take one point from the game but that will be little consolation as their challenge had already suffered a disappointing setback on Saturday, when they went down 4-3 away to Fife Flyers. Belfast started well against a Nottingham side who were also falling off the pace in the title race. Shields put the home side ahead after Radja and Desmarais had carved open the Panthers' defence with a swift exchange of passes. Desmarais then despatched a second into the net four minutes from the end of the first period, Radja again with the assist. The Panthers hit back in the second period, Farmer pulling a goal back, then a speculative shot by Kolnik was deflected and the puck looped up and over a hapless Stephen Murphy into the Belfast net. Nottingham were then left to rue two penalties that handed the initiative back to the Giants at the end of the period. Beech tipped in a cross-crease pass by Brandon Benedict on the powerplay to make it 3-2 to Belfast going into the final 20 minutes of play. Kolnik made it 3-3 midway through the final period but Radja put the Giants back ahead a minute later. Radja had a goal and three assists to show for his night's work but there was another rally from Nottingham as Schultz made it 4-4. With no further scores the game went to a penalty shootout and Nottingham left with the win and the two points.